WASHINGTON, D.C. -- Media Matters President Angelo Carusone released the following statement after Donald Trump appeared on Fox News’ Hannity for the 70th time since Trump announced his presidential run. Earlier in the day, Trump threatened to shut down news outlets critical of him. Hannity’s sit-down with Donald Trump reminded me of Trump’s announcement speech to a crowd of paid actors. It was scripted stagecraft, which is exactly what you’d expect to see when a leader following the authoritarian playbook and his principal propagandist sit down. This was the news media equivalent of a sour burp. And Hannity’s odious sycophancy on display is a reminder of why advertisers have started to abandon his show. Sean Hannity’s Fox News show has long been built around the propaganda tactic of repetition, but now a series of Media Matters studies of Hannity's opening monologues shows he has turned that method toward casting doubt on the legitimacy of any criticism of the president. Hannity referenced the “media” 393 times, mentioning it in 57 monologues. He criticized the press in 90 percent of his monologues. He mentioned “fake news” 67 times. Hannity referenced the “Democrats” or the “Democratic Party” 218 times across 51 monologues. Hannity referenced the “deep state” 74 times in a total of 20 monologues. He criticized the unmasking of Trump associates by the intelligence community in 14 monologues and leaks in 17. Hannity mentioned “establishment” or “weak” Republicans in13 monologues and “Never Trump” Republicans in 11. Hannity referenced Bill and Hillary Clinton by name at least 342 times, mentioning one or both in four out of every five monologues. He referenced the private email server Clinton used as secretary of state in 26 monologues, 43 percent of the total. Hannity suggested Trump did not collude with Russia in 31 of his monologues, 51 percent of the total. Hannity called for Mueller’s investigation to be terminated in seven monologues, 11 percent of the total. He called it a “witch hunt” 19 times. Hannity claimed that Hillary Clinton is the candidate who actually colluded with Russia in 25 monologues, 41 percent of the total. Hannity has regularly called for investigations into the perceived crimes of Clinton (25 monologues), Comey (17 monologues), and Mueller (seven monologues), among others. Hannity’s top guest over the term of the study was Jay Sekulow, one of Trump’s personal lawyers for the Russia probe, who appeared in 37 episodes of the program. 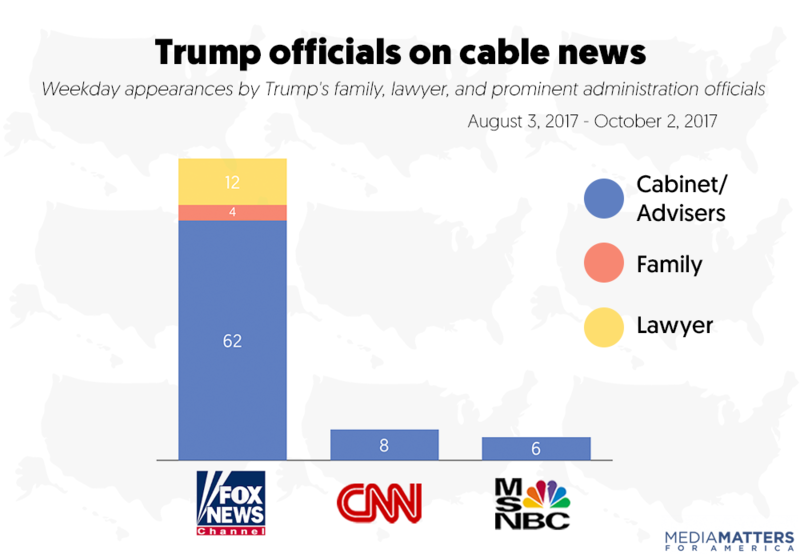 Prominent figures in the administration, members of his family, and his personal lawyer made more appearances (19) on Hannity than on all programming on CNN and MSNBC combined. These Trump-linked guests made 78 appearances on weekday Fox News programming, compared to eight on CNN and only six on MSNBC. 60 percent of appearances by the guests on Fox were concentrated on two programs: Fox & Friends and Hannity. More on advertisers leaving Sean Hannity’s show and a recent Associated Press report that looked at the first week weeks of the Stop Hannity effort HERE. And, HERE is a list of Sean Hannity’s current Fox News advertisers.